Last year I blogged on how there was a role for all of us in preventing suicide. The focus of this latest blog is on actions that local authorities and organisations can take to reduce suicide rates in their areas. Suicide prevention is a major programme of work for Public Health England. Our belief and starting point is that suicide is not inevitable, and we will continue to support the public health system in making a substantial contribution to saving lives. I am going to outline some of the resources and data, from Public Health England and others, which are designed to assist local authority teams in their vital suicide prevention work. All of these resources are available on our suicide prevention portal on GOV.UK. 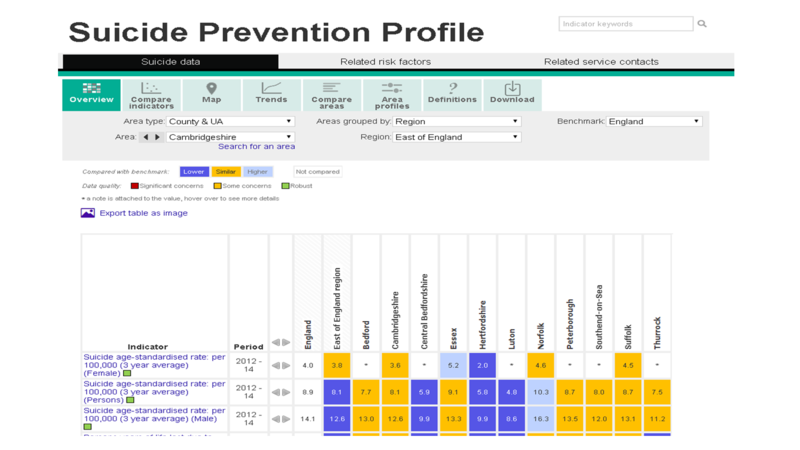 Launched by our Mental Health Intelligence Network earlier this year, the suicide prevention profiles collect and present a range of data on suicide and related issues for local organisations. It is perhaps the best place to start for anyone working on preventing suicide in their local area. The data is presented under three domains: suicide data, related risk factors, and related service contacts. The aim of presenting the data this way is not to name and shame, but to help local organisations understand the particular issues in their areas and respond accordingly. Having better data means making better decisions. The development of a local suicide action plan is recommended by government and supports the 2012 strategy ‘Preventing Suicide in England. A Cross Government Outcomes Strategy to save Lives’. A survey by the All Party Parliamentary Group on Suicide and Self Harm found that around 70% of authorities had a local action plan already in place, but obviously there is work to do to support the update of existing plans and encourage the remaining 30% to introduce a plan. The Identifying and responding to suicide clusters resource supports local authorities in effective responses to unexpectedly high numbers of suicides occurring in a particular period of time, a particular place, or both. Suicide clusters understandably cause great concern and may lead to hasty responses. No single agency is likely to have the resources or experience to manage these events on their own. By local bodies working together they can analyse any situation quickly and prepare a coherent, measured and co-ordinated response. The resource highlights how imperative it is that plans for such events are in place before they occur to ensure an effective response. Around a third of all suicides take place outside the home, in a public location of some kind. There are a number of effective steps that can be taken to prevent public places being used for suicide and to increase the chances of last-minute intervention. Responding to high risk locations guidance outlines the most practical and impactful actions that local suicide prevention groups can undertake. The Suicide Bereavement Support Partnership (SBSP) is the UK’s national hub for organisations and individuals working across the UK to support people who have been bereaved or affected by suicide. Recently launched, the Support After Suicide website helps anyone bereaved by suicide to access timely support and information by signposting to a range of help and resources. 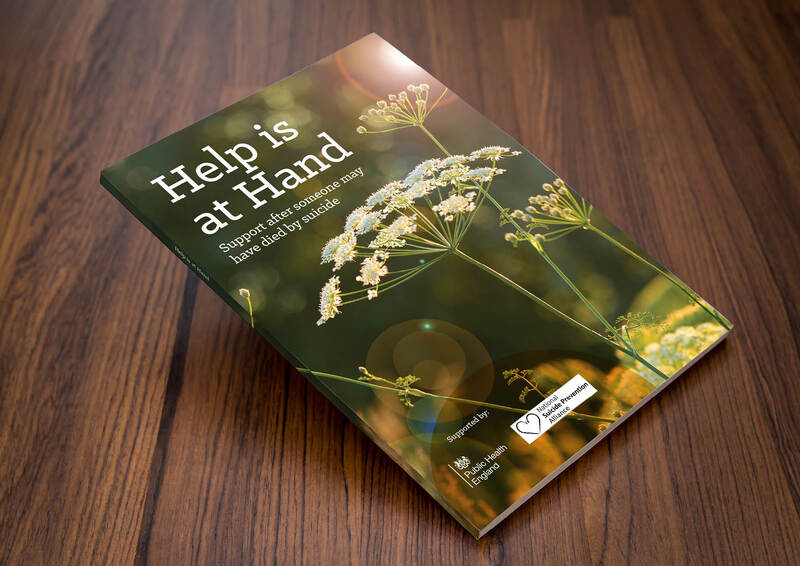 The website also hosts Help is at Hand – a practical and emotional guide for anyone affected by a suicide or a suspected suicide. Local authorities can order printed copies of the guide to be given out by bereavement support organisations and by those who are likely to be first on the scene after a suspected suicide, including police and ambulance staff. Through partnerships with coroners, funeral directors, police, doctors and bereavement counselling and support organisations we hope Help is at Hand will reach those that will benefit from the support it provides. Nationally and regionally PHE has significant expertise in suicide prevention and are on-hand to support local organisations working in this area. For any local professionals looking for further information or support, I encourage you to get in touch with your regional centre mental health lead.